Every successful company has benefited from an excellent corporate strategy. With the proven techniques in this portable, hands-on guide, your business will reap the same rewards. 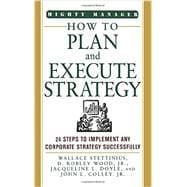 How to Plan and Execute Strategy shows how to get a leg up on your competition and sustain your lead for the long run.